To swipe a phrase from my other favourite band, we are now into ABBA’s “imperial phase”, their shift from one-hit wonders to the world’s biggest pop group sudden and complete. 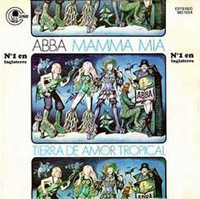 The world had, in fact, been patient with ABBA – “Mamma Mia” is the fourth single from their self-titled album, the others – “So Long”, “I Do I Do I Do I Do I Do”, “S.O.S.” – having been each more popular than the last. That triad looks like an evolution now, but they were all on the same record, so the development is in the band’s (and Stig Andersson’s) understanding of what they were commercially capable of: a play-safe “Waterloo” throwback, a lilting bit of light pop and then the fully unleashed melodrama of “S.O.S.”, indelible melodic hooks melded perfectly to the song’s emotional beats. “Mamma Mia” is more iconic than “S.O.S.” but it’s not as good. The ABBA sound still has a bit of glam in it – those glittery smeary guitars over the intro; the boys getting near the mic – and this would gradually fade, but this record is a mish-mash of ideas done well here but better elsewhere in their catalogue. The nervy stacatto piano bed, for instance, shows up again with more confidence on “Money Money Money”. The shouty “JUST ONE LOOK!” hook calls back to “Waterloo”. The record’s best moment – that sudden sweep into “Yes, I’ve been broken hearted…” – is its most ABBA-ish, showing their flair for (forgive my lack of technical terms!) inserting ballad-y hooks into upbeat songs. And finally, I don’t think the lyrics are up to their later standards – the “Mamma Mia!” refrain itself feels like a working title to fit the melody which just hung around because they couldn’t think of anything better. Some people’s tolerance for ABBA is low because their music is so inescapable – I respect that point of view but if anything I feel I don’t hear enough ABBA, there are swathes of marvellous Andersson/Ulvaeus songs which get overlooked in favour of the usual five or six. But of those five or six, this is the one where I can most sympathise with the ABBA-weary: its lack of an emotional catch for me makes it more vulnerable to overplay. “Leave me now or never” is the hook that really suckers me, the “ne” of “never” offering more room to play than the “sist” of “resist”. But perhaps that’s just me. I’m still feeling young here but can’t remember a time without Abba – and they soundtracked my childhood even more comprehensively when big sis started buying records. That’s years away yet. I remember James Burke’s Connections! Iffy science, dodgy history, but brilliant television! Also, going back even further, The Burke Special. And, apropos of a couple of number ones ago, the BBC’s voice of the Apollo missions. Nowadays, the erudition that was once a must-watch for much of the population is now frowned on as ‘elitist’, and for anything of this sort a ‘celebrity’ must be drafted in. It all seems very counterproductive to me. Many of JB’s connections and intertwining threads were extremely tenuous but it provoked the viewer to think (laterally rather than linearly) and it went out on peaktime BBC1 (Thursdays?). Very much a formative influence on my own theories about music writing and, as you say, a reminder of an age where public broadcasters aimed to stimulate the highest common denominator of its audience rather than patronise the lowest. i also recall connections, and JB’s other shows. they had quite an impact on me, and my academic direction. I’m too young to remember James Burke, but anybody who got a namecheck in a Human League song (The Black Hit Of Space) was obviously a person of considerable merit. The really brilliant thing about Connections (apart from the charismatic Burke, who rather confirms the point) is that it made public the bleedin’ obvious (to me) point that things happen because they are ready to happen, because all the things that need to happen first have fallen into place, not because some lonely, driven genius is working away in isolation. The names that get themselves associated with big changes; the Newtons, Mozarts, Einsteins, and yes, the Brian Epsteins and Malcolm McLarens, do so because they are skilled self-publicists more than they are innovative geniuses in a vacuum. So, what’s about to happen to pop is going to happen, not because anybody had a sudden spark of inspiration, or got into a studio and stomped, but because social, economic and technical influences were coming together in a particular way. That’s my theory, anyway, and I’m sticking to it! As I recall “Connections” was on a Tuesday night, and for much of its run it was in a double-header with the drama series “The Voyage of Charles Darwin”. Quality stuff, I didn’t usually get much homework done on a Tuesday at that point. Griff Rhys Jones in “Not the Nine o’Clock News” did a great parody of James Burke’s style (Google tells me it was broadcast on 14 April 1980!) along the lines of: “The whole thing could be explained very simply. So why isn’t it? … (much more in same vein) It all boils down to five words. I’m. Clever. And. You’re. Stupid. there was much to make fun of with JB. his columns in the Sci Am read a bit like parody. Thanks to Tom and Billy for the ABBA advice! Unfortunately i gave up on the turntable a few years back but I managed to download most of the tracks recommended-you’re right, Bill, “When I Kissed the Teacher” is a stormer(check out the vid on youtube in which Frida is the coolest woman in the world! )and I will keep my eye out for More Abba Gold in the future! Cheers! Ha ha, that promo is great – Bjorn and Benny as the world’s oldest schoolboys! Particularly touching is the way that it evokes real human awkwardness on the part of both the kisser and the teacher – as would actually happen in real life. A contemporary video would add a familiar veneer of psuedo-sexiness to the thing and ignore the vulnerability. I’m really, really sorry, and I know it makes me sound like a grumpy old rockist, but I can’t stand Abba. Sorry. No need to apologise – I am a little surprised that the pendulum on ABBA has swung *so* much back in the other direction (though I suspect this website has a skewed sample). Oh, I guess that happened a month ago. Never mind. Tom – absolutely spot on. My guess (and I might be a little too young to have got the drift, but I hope you’ll understand what I’m aiming at) is that – this ties in to the whole “Guilty Pleasures” concept – there is a reason why they’ve been rehabilitated. And then all the (sensible) people who didn’t give a rats hoot for hipness became, for want of a better word, validated, and it all grew up and exploded. That lop-eared tyrant is also watching discussions of the 90s ABBA revival closely, it should be said. So I’m eager to read what everyone has to say, both critical analysis and personal recollection. Because it’s an odd feeling to have missed out on the phenomenal aspect of a pop phenom – particularly one that has now shown itself to be a permanent part of the cultural landscape (a landscape that now includes America, thanks to “Mamma Mia” – the musical, that is). As for my reaction at the time, I thought “Waterloo” was exciting and fun, “Dancing Queen” was lost on me due to my blinkered Midwest white guy’s kneejerk dismissal of anything remotely disco, “Fernando” was a puzzler (“Really? A song about the Spanish Civil War?”), and I don’t think “Knowing Me, Knowing You” registered much one way or the other. I think my common reaction to each record was how strange they sounded, simply because there seemed to be a total lack of black influence. Now I like a lot of ABBA – although I lean more toward the peppy, up-tempo numbers, versus the ones that sound more like show tunes. In fact, I think hearing “Bang-a-Boomarang” on the B-side of some single was the moment when I first thought, “OK, I think I’ve missed something here,” which led me to buying the two Greatest Hits CDs, followed by the first few albums. They still seem strange in their lack of black influence – although better informed listeners may very well point out what I’m missing on this count – but they also often times seem wondrous in their pop glory, and their deep love of the whole idea of Pop. wwolfe my biggest example of “ok this is a huge cultural thing which I have virtually *NO* foothold on” is KISS! – which I guess was contemporary to ABBA’s success. Wwolfe – You might find Voulez Vouz (1979) an interesting album, because its them trying to complete the circle and break America by sounding a bit like The Bee Gees, and hence more disco than elsewhere. Talking about this album won’t upset the spoiler bunny, because its the one which didn’t spawn any UK number ones. It’s great, obviously, but I’ve never met anyone who’s said its their favourite ABBA album. String quartets are prissy? Wash your mouth out, young Tom. None of this Beano stuff here! No no string quartets the way ABBA used them on that track are prissy! – I think they’re trying to get the precision of the string parts on “Dance Dance Dance (Yowsah Yowsah Yowsah)” but they end up at ‘fussy’ instead. Tom, the KISS analogy is very apt. For I was indeed a member of the mighty KISS Army at exactly this moment. My best friend and I were standing on our folding metal chairs in the sixteenth row at the Cleveland Coliseum this very year, in fact, singing along with “Detroit Rock City” and all the rest. I still haul out an album to hear a track or two now and then. But, ironically, I probably listen to more ABBA. I had taken “Far From The Madding Crowd” to read and being in a children’s ward, this was something of a curiosity to the nurses, one of whom had actually been to my primary school, funnily enough. I recall an older doctor asking me what I thought of Thomas Hardy. I told him I was only reading this particular book because I was in love with Julie Christie. I, too, was in love with JC–maybe I still am. I don’t know… one of the things that I like about Mamma Mia, and the reason it seems to stand taller in my eyes, is that it’s so much less *bombastic* than so many of their other songs. I know many people prefer things like SOS, but to me, the structure and restraint on Mamma Mia is far more representative of the ‘talent’ behind ABBA – the guys, than the histrionic vocals on so many of the other hits were. @wwolfe # 49: I think you may have undersold ABBA’s US success. While it’s true that they weren’t ‘Kings’ the way they were everywhere else, they were certainly consistently successful from ’74 – ’81 just like everywhere else. ‘Waterloo’, ‘The Winner Takes it All’, ‘Take A Chance On Me’ were all top ten hits. ‘Dancing Queen’ was a # 1. ‘The Name of the Game’, ‘SOS’, ‘I Do I Do I Do’, ‘Fernando’, ‘Knowing Me Knowing You’ were all top twenty hits. ‘Mamma Mia’, ‘Honey Honey’, ‘Chiquitita’, ‘Does Your Mother Know’, ‘When All is Said and Done’ were all top forty hits. So they were very successful throughout the years. The reason they never really became the world-beating stars they were everywhere else was simple; they hardly ever toured. Agnetha hated flying, and they only did one proper US tour (and it was small). This meant that their albums never went as high or stayed around long enough, and the singles had to chart without support. ABBA were big, they did have fans, but in the US more than anywhere else; if a band doesn’t show up and play – they aren’t going to be as successful. The success that ABBA achieved without even being there just underscores what they could’ve achieved if only they had been there. Somehow never cared much for Mamma Mia. Probably a combination of the facts that (a) it followed the far superior SOS, (b) had that tiresome video with all those lip close-ups and (c) stopped the wonderful, underrated and infinitely better showmen Sailor from getting no 1 with Glass of Champagne.